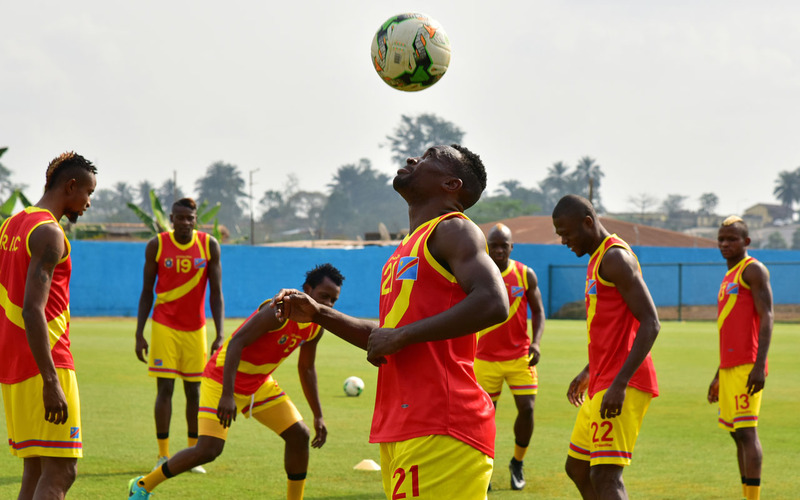 The delegation of Senior National Team of Democratic Republic of Congo, otherwise known as Simba, flew into Port Harcourt on Thursday night ahead of Monday’s 2018 FIFA World Cup Send Forth encounter with the Super Eagles. Ranked 38 in the world (nine places ahead of three –time African champions Nigeria), the Simba themselves came very close to a Russia 2018 ticket, conceding to Tunisia only on the last day of the race. A period of loss of concentration, which enabled the Carthage Eagles to score two quick goals and tie their encounter in Kinshasa on 5th September 2017 was their undoing, as subsequent victory over Libya in Monastir was neutralized by Tunisia’s own defeat of Guinea. Yet, the Simba, who won the Africa Cup of Nations on home soil in 1968 and in Egypt six years later, is never a team to be under-rated. The team holds the record of being the first African side south of the Sahara to fly Africa’s flag at the FIFA World Cup, way back in 1974. Nowadays, the likes of Gael Kakuta, Benik Afobe and Cedric Bakambu lead the line for the Simba, and though a painful loss the World Cup ticket was, they look forward with high hopes to the 2019 Africa Cup of Nations race, in which they hammered neighbouring Congo 3-1 at the start of the campaign 11 months ago. Rivers State Governor Ezenwo Nyesom Wike will be chief host as the Super Eagles test strength against the feisty visitors at the Adokiye Amiesimaka Stadium on Monday, with scores of other prominent Nigerians and tens of thousands more to have a last opportunity to cheer their team before departure to the FIFA World Cup finals in Russia. Nigeria’s squad includes Captain Mikel John Obi, Ogenyi Onazi and Ahmed Musa – who all featured at the last World Cup in Brazil – as well as Olympic bronze medallists Abdullahi Shehu, William Ekong and Oghenekaro Etebo. They provide the spine for a young team that was actually the youngest to make it out of the qualifying series. Young and confident performers like Leon Balogun, Olaoluwa Aina, Ikechukwu Ezenwa, Brian Idowu, Wilfred Ndidi, John Ogu, Joel Obi, Kelechi Iheanacho, Moses Simon and Alex Iwobi add fluorescence and swagger, and the experience of the likes of Kenneth Omeruo and Elderson Echiejile would do no harm.Monday’s clash will be the seventh official clash between both countries, with the most famous encounter being an Africa Cup of Nations battle in a sunny Dire Dawa, Ethiopia in March 1976, in which a young Eagles squad overhauled defending champions DR Congo (then Zaire) by four goals to two.